Fortunately, I realized that online coaching programs would be such a valuable asset for my business, that I eventually sucked it up and got on with it. ‘Feel the Fear and Do It Anyway‘, right. Boy, am I glad I did. It has transformed my business! Now, I can be anywhere and work with amazing people all over the world in an organized and structured way. I also have a great additional income stream. If you are secretly ready to run your first online coaching program, but haven’t taken the final step, yet, this is for you. 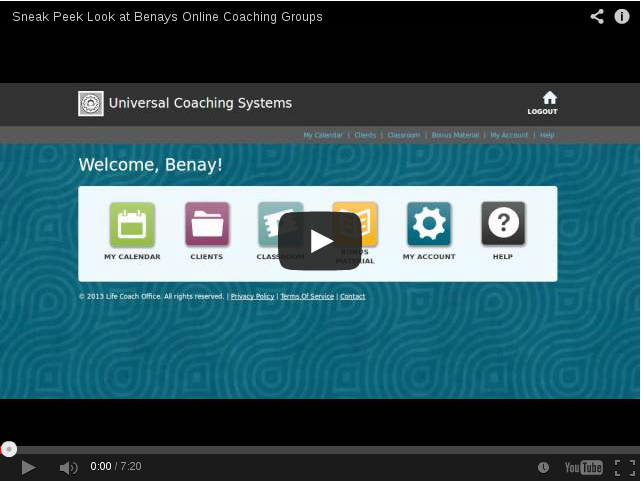 I’m going to show you first hand, how simple it can be to set up and manage your own online coaching program. P.S. You can try out Life Coach Office for 30 days for just $13. It’s a month by month commitment so you can stay for as long as you like. I have just read your latest article on group coaching. You can certainly leverage your time through group coaching and I must say before being part of your group it was a very daunting task! I so agree with Julie. The group feature is perfect for increasing my bottom line. So if I’m understanding you correctly you are providing group ‘workshops’ not necessarily coaching, since in group coaching the agenda is dictated by the group? How do you vet your client for enrollment to be sure it’s a good fit for the group? Love your updates – full of practical value add. The online platform looks simple and professional. Will email you a couple of questions i have.